Why preach a Revelation series? The program troubled me for two reasons. First, I find the opinions that Baxter espousing to be in error. Serious error, in fact. Very soon we will get yet another Left Behind film that will support and encourage much of this same thought. Many are fascinated [if not obsessed] with this type of reading of Revelation. But, is this the best reading of the text? Secondly, I know many evangelicals that don't support such ideas/theology. VICE painted this issue with broader strokes than are necessary. As a matter of fact, the church throughout much of our history hasn't supported this theology. Not all Evangelicals read Revelation in a similar way. What about them? Maybe those who don't read it similarly haven't taught on it enough or presented a case for alternative understanding. After watching the program, I started talking to some friends [including the staff at State Street] about what I had watched and many, much to my surprise, had [at one point] bought into these ideas. Some even joked about how they would be terrified going into a room without any people in it wondering if their loved ones had been raptured. A few mentioned about how much fear was instilled in them because of the effects of this theology. Interestingly, most [if not everyone of them] couldn't tell you about why the early church didn't support such theology or the evolution and development of rapture theology, but they knew that many of their teachers scolded those who didn't support an identical reading of Revelation. It was [and is] an essential doctrine in many Christian movements [someone please alert those in Nicea!] So, I think it's time to deal with this giant literarily-complex, theologically-rich apocalyptic elephant in the room at State Street. The goal is not to do this series in a combative, reactionary way [though much of it was birthed from a reaction], but in a way that hopefully illuminates and brings hope to our understanding of the narrative. To preach what I believe to be a proper and responsible reading of Revelation. You may not agree with such a reading, but at least you'll be familiar with other possible interpretations. Ultimately, it's fine to agree-to-disagree but it's best to fully know and understand the basis of the disagreements. To open up a counter-narrative interpretation of the text that combats a more modernist, dispensational reading with an understanding of the text that is, ultimately, more congruent with how the church throughout history has taught Revelation and fits better within the scope of the biblical narrative. We'll be looking at literary style, genre, functions of apocalyptic literature, etc. To make my former professors content, we'll employ a Wesleyan hermeneutic to Revelation: prima scriptura, tradition/church history, intellect, and guidance by the Holy Spirit. To be encouraged and made hopeful by how Christ is bringing the world back to rights [to steal a N.T. Wright-ism]. This is our peculiar Christian hope. I will be finishing up our "Parables of the Kingdom" series soon. We will then begin a series I'm very excited about. The series was designed to do a few things; (1) talk about the different Christian movements that have influenced State Street, and (2) seek understanding across our ecumenical borders leading to a better appreciation of other expressions of our faith. 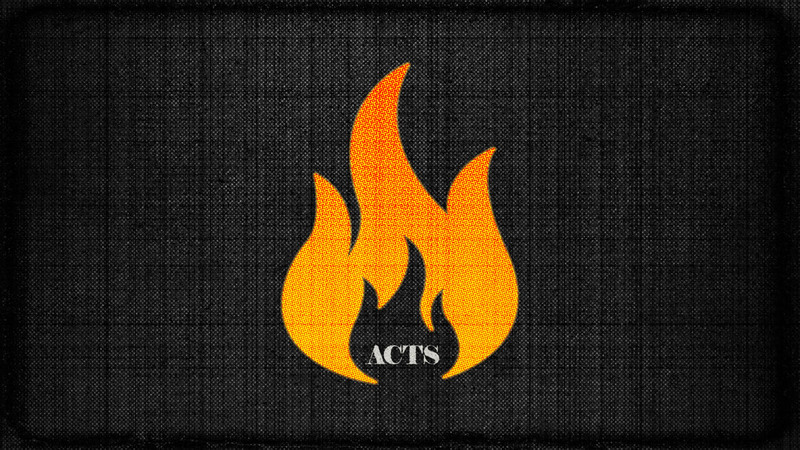 My two primary influences are the Wesleyan and Anabaptist movements. This bleeds through to the culture at State Street in very tangible ways. But, there are other influences that we embrace as well. Many people at State Street come from other backgrounds that have helped them (and us as a community) see Christ more clearly. Some in our community are unfamiliar with other denominations as a whole. We'll talk about the founders of the movements (Menno Simons, John Wesley, Martin Luther, Alexander Campbell, etc.) but also abou the larger contributions of each theological distinctive. 1When the day of Pentecost had finally arrived, they were all together in the same place.2Suddenly there came from heaven a noise like the sound of a strong, blowing wind, and it filled the whole house where they were sitting. 3Then tongues, seemingly made of fire, appeared to them, moving apart and coming to rest on each one of them. [unique, this won't happen again] 4They were all filled with the holy spirit, and began to speak in other languages, as the spirit gave them the words to say. 5There were devout Jews from every nation under heaven staying in Jerusalem at that time. 6When they heard this noise they came together in a crowd. They were deeply puzzled, because every single one of them could hear them speaking in his or her own native language. 7They were astonished and amazed. “These men who are doing the speaking are all Galileans, aren’t they?” they said. 8“So how is it that each of us can hear them in our own mother tongues? 9There are Parthians here, and Medians, Elamites, people from Mesopotamia, Judaea, Cappadocia, Pontus, Asia, 10Phrygia and Pamphylia, Egypt, and the parts of Libya that belong to Cyrene; there are people from Rome, 11proselytes as well as Jews; there are Cretans and Arabs. We can hear them telling us about the powerful things God has done—in our own languages!” 12Everyone was astonished and perplexed. “What does it all mean?” they were asking each other. 13But some sneered. “They’re full of new wine!” they said. 18Yes, even on slaves, men and women alike, will I pour out my spirit in those days, and they shall prophesy. 19And I will give signs in the heavens above, and portents on earth beneath, blood and fire and clouds of smoke. Because he is at my right hand, I won’t be shaken. And my flesh, too, will rest in hope. 37When they heard this, the people in the crowd were cut to the heart. “Brothers,” they said to Peter and the other apostles, “what shall we do?” 38“Turn back!” replied Peter. “Be baptized—every single one of you—in the name of Jesus the Messiah, so that your sins can be forgiven and you will receive the gift of the holy spirit. 39The promise is for you and for your children, and for everyone who is far away, as many as the Lord our God will call.” 40He carried on explaining things to them with many other words. “Let God rescue you,” he was urging them, “from this wicked generation!” 41Those who welcomed his word were baptized. About three thousand people were added to the community that day. At the beginning of the sermon, I use statistics from this book: The Rise of Christianity: How the Obscure, Marginal Jesus Movement Became the Dominant Religious Force in the Western World in a Few Centuries by Rodney Stark. Question we're asking during this series: The question all must ask in a post-resurrection, Christo-centric yet broken world; What now? 13When they saw how boldly Peter and John were speaking, and realized that they were untrained, ordinary men, they were astonished, and they recognized them as people who had been with Jesus. Galileans as "Boorish dolts in the eyes of sophisticated Jerusalemites." POINT 1: In our story, God does beautiful and redemptive things in the most unlikely places, often times in the places you’d least likely expect Him. POINT 2: Salvation is found in who you call "Lord". POINT 3: Baptism calls people to death, so we might live. Baptism is the proper response to those that are witnesses to resurrection. Baptism engenders a new community of love, resurrection, and justice. for we are all lost without you. test us and know our troubled thoughts. Forgive us of our wrongs. to come at last to the age to come.